Not all tracks and strands will be offered by schools in your area. You should check the available options first. Try to inquire too if the schools are well equipped. Some colleges are also offering Senior High School. These are mostly private colleges but you can use DepEd’s voucher program to get discounts. Are you planning to proceed to college after Senior High School? What course are you planning to take? If you can have the answer to these questions, then it will be easier to choose among the different tracks and strands. Everyone will study the core curriculum and choose one track. This is pretty self-explanatory. Are you an athlete? Do you want your life to be all about sports – playing games, officiating and coaching? Then this is where you belong. After Senior High School, you can already work your way to becoming a professional athlete or have a sports-related job. You can also proceed to college and major in Physical Education. This track is for the artistic ones not just in painting or drawing but also in performing. Choose this if you want to be a painter, singer, dancer, actor, sculptor, director or any related job. 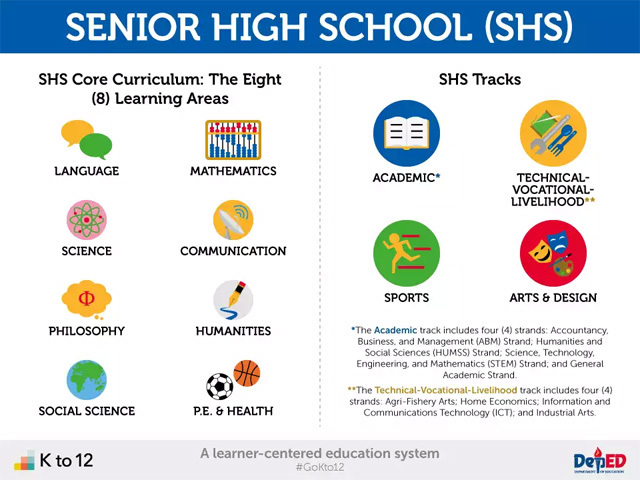 Again, you can choose to work after taking this track in Senior High School or proceed to college with a similar course such as Fine Arts, Theater or Cinema. This is our classic idea of the TLE subject. Those who are interested in housekeeping, tailoring, caregiving, food and beverage services, bread and pastry services, tourism and handicrafts should choose this. Take note though that this isn’t the correct strand for those who are planning to take Hotel and Restaurant Management (HRM) in college. Most students who choose this have plans to work in the aforementioned areas immediately after Senior High School. Interested in computers? The ICT Strand is the perfect choice. You’ll be taught how to write computer programs, websites and possibly apps. This includes Medical Transcription and Computer Animation. After taking this strand, you can then proceed to BSIT in college. You can also work immediately as a computer programmer, animator or medical transcriptionist but make sure you’ve already learned enough. This strand is for those who are interested in agriculture and aquaculture. Horticulture, Pest Management, Animal Production, Slaughtering and Fish Production are all tackled here. Graduates from this strand might be able to work in farms immediately but they can also proceed to related courses in college. The last strand under the Tech-Voc track is our classical idea of what tech-voc is – Carpentry, Automotive Servicing, Refrigeration and Air-conditioning, Electronics Repair, Electrical Installation, Welding (SMAW), Plumbing and Tile Setting. If you’ve been thinking of taking up a TESDA program for any one of these, then you should choose this strand. After Senior High School, you can apply for a TESDA Certificate of Competency or better yet, a National Certificate (NC). Choosing the Academic Track means you have solid plans to proceed to college. The ABM Track is for those who plan on taking up Economics, Business Administration, Accountancy and Marketing in college. Those who are planning to take up HRM should choose this too. This one is for students who are eyeing Writing (particularly, novelists), Political Science, Sociology, Priesthood, Law and Community Studies. STEM is the perfect track to choose if you are planning to study Pure and Applied Sciences, Engineering and Mathematics in college. You will be studying Biology, Chemistry, Physics and Calculus in this strand. This is not for the faint-hearted. If you’re not yet sure what course to take in college, this strand is the same as you. It teaches Social Science, Humanities, Economics, Management and Disaster Readiness. How about po yung tourism pwede din po ba siya sa ABM Strand ?